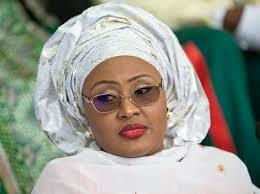 Aisha Buhari, wife to the president of the British Republic of Nigeria, one of the culpable Nigerians in the Halliburton Bribery Scandal, has once again canceled her earlier announced trip to Colorado USA, for the World First Ladies Conference. The ‘’All Progressives Congress’’ (APC) party, had earlier announced Aisha Buhari’s plan for this trip on the 27th of June 2016. They claimed that the first lady will attend the conference to prove her critics wrong. Earlier in June 2016, Aisha Buhari had been accused by the governor of Ekiti State, Ayo Fayose, of her involvement in the notorious Halliburton Bribery Scandal. He went further to expose the US Government’s Sentencing Memorandum which indicted Aisha Buhari on the 22nd page of it. After all her efforts which includes passport forgery, twitter fight, media chats etc, to retract the allegation; she finally came up with the false claim of plans to travel to the US for a long scheduled World First Ladies Conference which she has canceled as expected. Notably, this is the second time Aisha Buhari has canceled her trip to the United States of America in one year. She also has not visited the United States since the probe of this bribery scandal commenced. Aisha has canceled this trip to the disbelief of those that perceived her to be innocent of the accusations, to the bewilderment of those that bought the tale of Fake versus Real Aisha Buhari. This further explains why Buhari has obstinately refused to probe the scandal and recover the looted money. It has unraveled the myth behind Buhari’s forfeiture of the country’s $140 million. At this point, it is only needful that all Biafrans home and in Diaspora should continue to demand for the probe of this bribery scandal, for the sake of justice and better society. Nigeria has to learn that a corrupt-free government is not just for media chats but is practiced.